Become A Media Maven®. It’s My New Podcast! 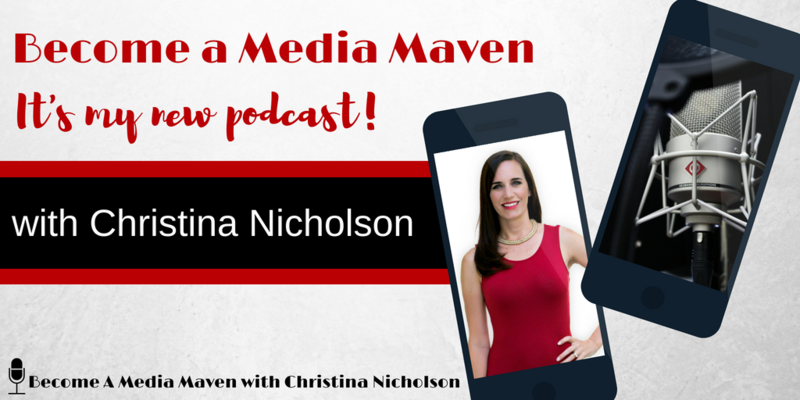 Welcome to the first episode of Become a Media Maven®, a podcast by TV veteran Christina Nicholson… ME! It’s for small business owners who need a little help with their marketing strategy to earn big-time publicity. In this episode, I share my view of public relations from both sides of the camera. I’m going to tell you why I started this podcast and go straight into some media mentoring. I want to tell you how to start getting media coverage NOW. I’m going to share strategies you can implement today and take you behind the scenes of how I’ve earned coverage for a few clients and go through how I did it, step-by-step. I’m super excited to bring you my very first episode of Become a Media Maven®. Starting a podcast has been on my list of things to do for a couple of years now… but, I was going to wait. My plan was to get some things done and out of the way first, but I was talking to a friend about this a couple of months ago. That friend is Dana Malstaff from the Boss Mom Podcast. I told her it was on my list of things to do because she was asking me, “Why don’t you have a podcast yet?” I told her it was coming and she said, “No, no, no. You need to do this NOW.” She reminded me how valuable it would be for my business and how many people I could help. When I was on Dana’s podcast, it was an amazing experience. It grew our relationship and I got to meet a lot of people who reached out to me after hearing me on her podcast, so I understood what she was saying. When she told me that I could not only be a guest on others podcasts but also use a podcast as a lead generation strategy instead of looking at it as “a thing to do later”, it clicked. It’s a great strategy to add to my marketing plan… another tool to add to the toolbox. What have I been waiting for? I don’t need to wait to get these other things done. I need to make this part of my strategy, of my business. Not just marketing, but business. I also work with Pat Flynn. I am currently in his Accelerator Mastermind program, so I said, “Pat, Dana said I should start a podcast. What do you think?” Of course, he agreed ad started helping me right away through his Power Up Podcasting course. Power Up Podcasting is an insanely valuable resource if you’re starting a podcast, especially when it comes to all the tech stuff, the recording, buying the right microphone, and more. So, I started going through Power Up Podcasting and I decide… I’m kind of liking this thing. The entire point of Become a Media Maven® is to share so much value that you will be able to reach people in the quickest amount of time… and you won’t be just reaching anybody. You’re going to be reaching your ideal audience and you’re going to be reaching hundreds, thousands, or even millions without spending any money on advertising. That’s probably what you can expect in most episodes, but with that comes a whole lot of other things. Today, the media industry is constantly changing, and it’s changing fast, so there’s so much overlapping. There’s your own media, there’s paid media, and there’s earned media… and they all kind of worked together. If one is terrible, the other two aren’t going to be great. If one is great, the other two can get even better. In this episode, I want to tell you what to expect, but I’m not just going to tell you what’s coming up. I’m actually going to do a little media mentoring with you. This is for you, if you are a business owner – if you’re an established business owner making millions, this is going to help you; if you are a new business owner, maybe making as little as a few bucks a month, this is going to help you too; if you’re thinking of starting a business and you don’t know where to start, this is probably a good place to start because people can’t do business with you if they don’t know you. This podcast is about getting you known. It’s about making you more visible and if you are already in business and you’re doing just a few bucks a month, maybe you’re doing millions, you could do more if more people knew about you. People do business with people they know, like and trust. The whole idea behind Become a Media Maven® is to get you known, liked, and trusted. I’m going to start with earned media. Obviously, this is my favorite form of media just because it is where you’re going to get, I would say the biggest bang for your buck, but it’s earned so you’re not paying for it. So, I’m gonna say it’s worth going to get the biggest bang for your time. When I say earned media, it is exactly what it sounds like. It is media that you earn. It is getting coverage on TV, having somebody mention you in a newspaper article, being featured as a guest on a podcast, etc. You’re not paying for this coverage. A person who works for or contributes to that media outlet thinks you are worthy of time, space, and airwaves. Whatever the platform is, they are giving you that platform to share your message. There are a couple of reasons this is so valuable. First, I want to talk about the two ways you can start earning coverage. There are basically two different kinds of pitches. The first one is pitching yourself as an expert in your industry and the second one is pitching your service or your product… and you need to be doing both of these. Many times people want to stay behind the scenes and they don’t want to pitch themselves. They just want to pitch their service or their products, but they don’t want to be the face of their brand. That’s not going work because people do business with people. They don’t do business with businesses. Establishing yourself as an expert in your industry and pitching yourself as that expert is your low hanging fruit. That’s what you’re going to get the most exposure for. I want to give you a couple of specific examples and explain how I have done this for clients. A few years ago, I worked with a client named Martin who created a baby product called the Beebo. It’s a pretty cool product – something you throw over your shoulder, put a bottle into it, and move it around so you can feed your baby and be hands-free. He created this product because his son was having a hard time eating. He needed to be distracted. When he read to him while he was feeding him, he would drink his bottle, but it’s hard to feed a baby, hold a baby, and hold a book at the same time. So, this basically gave him a free hand. He solved his problem! I earned coverage in Entrepreneur Magazine, then Business Insider Magazine picked up the article. So you’re probably wondering, “How do you get him in Entrepreneur in Business Insider if this guy is selling a baby product?” Entrepreneur doesn’t write about baby products. Neither does Business Insider. We pitched Martin’s story as a dadpreneur. It’s business-focused, so we were pitching to business-focused outlets. We also did this around Father’s Day. That’s another tip. It was timely. If I would have pitched this in the fall, it probably wouldn’t have worked as well. I went into it with a Father’s Day angle about a dad starting a business. It’s a dad focused business, so we told his story of how he was at home, saw a need that didn’t have a solution, and started a business. He created the solution… and that is Martin earning coverage as an expert in his industry. While we’re hearing about Martin and his entrepreneur story, or his dadpreneur story, we’re also talking about his product, so his product is still getting coverage, but it’s not obvious coverage. It’s coverage earned in a roundabout way… and most of the coverage that you’re going to earn is going to look like that. It’s not going to be an obvious promotion because people don’t want to see that. They don’t respond to that. That’s why advertising doesn’t work the way it used to. So, that’s how you establish yourself as an expert. You pitch your expertise. The second way to pitch is by promoting your service or product. I’m going to use the same client with a different example. I earned the Beebo coverage on the Rachael Ray Show. Now, you may be thinking, “Okay, the Rachel Ray Show is about food and you’re pitching a baby product?” That’s right. Who watches the Rachael Ray Show? Moms. It’s all moms watching the Rachael Ray Show. After we pitched, we never heard anything… for a couple of month. We didn’t hear anything. In the meantime, we got the Beebo some media hits and other places. One of them I remember was a website called Trendhunter. It shared a bunch of cool, unique gadgets on the website. He put it on the back burner, then saw the Beebo mentioned somewhere else and it reminded him of the product and thought it was a great fit for an upcoming segment with a couple of moms who were testing some baby products. That is how you can promote a product and pitch a product. You never know who is looking at those small blogs or those small local newspapers – what they’re reading, what they’re seeing, who they know, who’s talking about it, and who’s passing it along to friends and family. If I did not earn the Beebo a hit in all of these other places, it probably never would have made it to the Rachel Ray Show because the producer saw it in another place after I pitched him. Remember, you don’t want to pitch in a promotional way, but in a way that helps a journalist do his or her job. Again, you’re only trying to help the journalists do their job. Stop trying to promote yourself. Now, stop and think for a minute. I just gave you three examples of coverage in Entrepreneur, Business Insider, and the Rachael Ray Show. Those three specific media hits did not cost Martin a dime. It’s the quickest way for him to reach the most amount of people in the shortest amount of time without spending any money. This is the value of earned media. If he would have paid for that coverage, that would have cost tens of thousands, if not hundreds of thousands of dollars. So, earned media is where you’re going to get the biggest bang for your time, but it will not work alone. Your media needs to look good to earn media. Imagine I pitched the Beebo and these journalists, bookers, and editors went back to the website and the website was a hot mess… or maybe the social media looked terrible. If that were the case, there’s no way they would have given him or his product the time of day. So, your media needs to look good. I gave her some tips, recommendations, and even some referrals to people that I knew. At the end of the day, she didn’t want to spend the time or money updating it. She tried to do a couple things herself and it helped a little bit, but not enough because Good Morning America said they could not put her on-air and send their viewers to a website that looked like hers did. GMA is the number one morning show in the country… and because a website was not up to par, was not branded the way it should have been, national coverage was lost. It could have been business changing… life changing, and it wasn’t working out because of the website. That’s just one example of how your own media can affect earning media. Then, there’s paid media… or advertising. It has a time and a place depending on your industry and depending on how you’re using it. I think my favorite, most recent story of paid media, that’s very 2018. When people think of advertising, they think of commercials on TV or in the newspaper. Now, let me tell you how advertising works today. It works through Facebook ads, influencer marketing… or should I say “influencer” marketing. Yes, so-called influencers are tricking you right. Left and center. I see big brands making huge mistakes and just wasting money paying “influencers” for exposure. These so-called influencers know the tricks and how to get paid or get a whole bunch of free stuff. That’s one way of advertising, and it does work, you just have to do your homework. We will get into this topic of influencers in later episodes of the Become a Media Maven® podcast, but I digress. If there are any Bachelorette fans listening, a recent episode of the Bachelorette was filmed in Richmond, Virginia. If you watch The Bachelor or The Bachelorette, you know they go on all of these trips to different places. They do these different things and if you’re wondering how they choose where to go and what to do, it’s through advertising. The folks who handle tourism for Virginia paid ABC $536,000 to shoot an episode in Richmond, Virginia. Part of the contract said that the show had to mention “Virginia is for Lovers”. Yes, they paid over half a million dollars for that. FYI, the show draws an average of six million viewers. That’s the way advertising is today… and that’s because people don’t pay attention to commercials. It used to be that you would pay for a commercial during the Bachelorette and that’s how people would find out about your brand. Now, it needs to be part of the programming because people have started ignoring commercials and obvious advertising. That’s why influencer marketing is so popular. It’s because people are ignoring the obviously sponsored posts. So, you get it in the post with #ad and more people pay attention. That’s why that’s working so well now. Again, we’ll get into that, but the point I’m trying to make here is if you’re paying for the media, you’re driving people somewhere, right? You’re either driving them to your website or you’re driving them to your brick and mortar store – wherever it is, you need that to look good so it converts because if it doesn’t convert, you’ve wasted money on the advertising. So many people do this with Facebook ads too, right? They think they have a great Facebook ad and people are responding, but then they’re not making any money because they’re putting all of their eggs in the Facebook ad basket that they forget where they’re driving people. That destination has got to be set up for conversions because if it’s not, then you’re just throwing your money away. So, you can see how all of these things work together – earned media, owned media, and paid media. Fun Fact: Most of the earned coverage I’ve gotten clients, most of the earned coverage that you will get for yourself, is going to be on the follow-up. Journalists have hundreds of emails in their inbox and you need to stand out. It’s hard to stand out, but if you keep following up and you do it in a non-annoying way, which we will talk about, you will start to earn media coverage. You need to know how to do these things to stand out in this very competitive space. When you do get the TV gig, or the magazine interview, or that podcast booking, you need to know how to ace it and build a relationship with the people you’ve worked with in the media to turn that coverage into more coverage. So many people make the mistake of earning coverage and sharing it once… and that’s it. You need to be constantly sharing the same thing over and over again while tagging the outlet, the reporter, the booker, or the editor. Social media is a crazy fast-moving feed of information. Depending on the algorithm, when you sign in, and when something’s posted, you’re probably missing a lot of stuff. If you didn’t miss it and you see it again in a couple of weeks, you’ve probably forgotten all about it because you’ve seen so much since then. We will also talk about how to turn one piece of earned media into more and how it kind of starts to snowball and when you get to that point, you don’t even need to pitch anymore because the media is coming to you! You’re getting emails, phone calls, and being invited to interviews so it makes your job so much easier… and it’s not just the media coming to you at that point. At that point, it’s leads! It’s people who want to work with you, who want to buy your product, who want to pay for your service. That’s the really important part about earned media. It’s like a third party endorsement. I can tell you I’m great. I can pay other people to tell you I’m great, but when you hear other people tell you I’m great and you know I’m not paying them to say it, it means so much more. That’s why you want and need earned media. Earned media is proven to be worth at least three times what advertising is. We are going to talk about everything in between because there is such an overlap with the way the media industry works today. Everything touches your social media, your SEO, video, influencer marketing… really, just about everything under the marketing umbrella overlaps with each other. Now, I want to take this time to explain why you should listen to me, subscribe to my podcast, and come back for more. Before that, I want to invite you to a free, five-day email course with proven results. People have reached out to me right after going through this email course to tell me they’ve earned coverage. One was on TV and in the newspaper. The other was on TV. The person actually did a live shot with a chicken. (How cool is that?) I call it Master Your PR and it is a crash course on earning coverage. Like I gave you those examples of my client, Martin and the Beebo, this will be super helpful and I’m walking you through steps day by day – Monday, Tuesday, Wednesday, Thursday, and Friday on how you can start earning media coverage and no time. Ever since I can remember, I wanted to be in the media. My uncle recently texted me a video of me reporting on the scene of him preparing to go skydiving. My mom was shooting a video and I was in front of the camera saying, “This is Christina Sens and we’re at the airport…” and then everybody kept telling me to get away so I really didn’t get to finish my report, but I was trying. Then in the eighth grade in Marion, Ohio, (a little town about an hour north of Columbus) it was career day and we got to go somewhere and learn about what we would do when we grew up if we followed our dreams. Marion didn’t have a TV station, so I went to a local cable station, which I think more of a local church channel. I stood at a podium and I read the announcements. I went to The Ohio State University and while I was there I interned at the ABC/FOX station. From there I worked at News 12, the Bronx, in Beaumont, Texas, in Fort Myers, Florida, and my last market was the Miami/Fort Lauderdale market where I was a reporter and anchor for about four years. The TV news business is a tough business to work in. It is cutthroat. It is heartless. It is a 24/seven operation. If you are anchoring the morning newscast, you’re up at 2:00 am. If you’re doing the evening news, you don’t get back to the station at midnight, which means sometimes you don’t get home till 1:00 am. When breaking news happens, nobody cares if you’re sick, if you are celebrating Christmas, or if you’re out of town because you have to cover it. After having two kids, it wasn’t the most family-friendly job for me to be in anymore, so I got into PR because I figured I’ve been receiving pitches for over 10 years now from publicists and business owners who clearly have no idea how the media industry works. These people wanted TV time and they thought terrible emails, press releases, and random pitches were going to get coverage. They clearly have no clue. So, I figured when I was getting out of the business, I’d just do that. I think I know how to pitch a reporter at this point. I worked at a PR agency for six months before starting my own… and I can happily and proudly say after three years I’ve grown my public relations agency, Media Maven®, to a multiple six-figure business. When I started on my own, my goal was to just be a professional freelancer. (That’s what I called it.) The plan was to take some jobs from other PR agencies, but one thing led to another. I started getting super busy and I didn’t want to work 24/seven, so I started building a team. We were doing a pretty good job so we were getting some referrals and I was doing PR on myself. I was treating myself as a client. So the leads started coming in and that is how I get most of my leads. I don’t network. I don’t make cold calls. I just treat myself as a client and I pitched myself to the media. I make sure my media, my website, and my social media, is running like a well-oiled machine. In addition to that, I have my own PR that I’m earning. I advertise very little. The only advertising I do is on Facebook when I am promoting my media mentoring program. I can also happily say I still am a member of the media. You can see me hosting segments on Lifetime TVs morning show The Balancing Act. I host monthly segments here on the number one station in Florida. I’ve also contributed to Inc., Fast Company, Huff Post, Buzzfeed, and most recently Medium’s Authority Magazine. So, I definitely come with a different point of view than most people in the PR industry because I have not only been on both sides, but I still am on both sides. 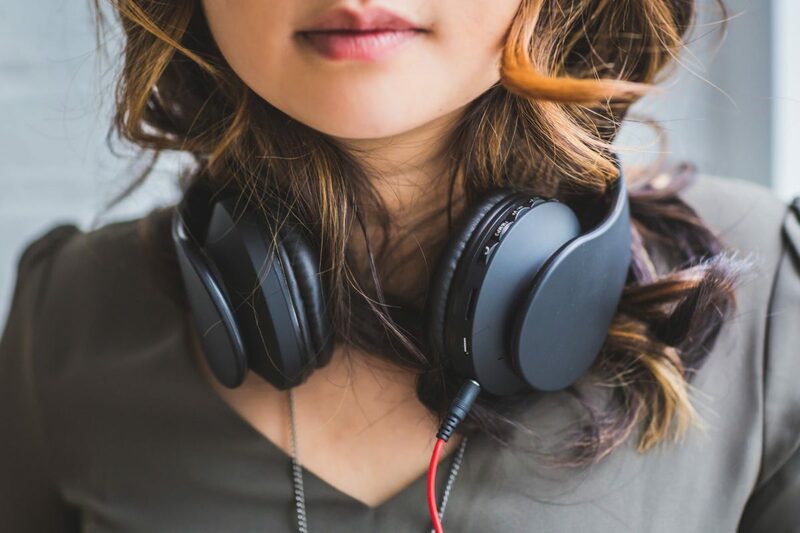 If you are looking for more visibility, you want to grow, you want more people to know who you are so you get more leads and make more money, the Become a Media Maven® podcast is for you. It’s going to give you so much value – whether or not you’re handling PR yourself, you’re at the point where you’re ready to hire an agency, or maybe you already have an agency or even a publicist on your team. We’re going to talk about everything good, bad, and ugly under the media and marketing umbrella. how my number one strategy for building an email list is being a guest on podcasts like this one. I am going to be bringing on some amazing guests. I am so excited to continue to bring you value here on Become a Media Maven®. Please subscribe to the Become a Media Maven® podcast.